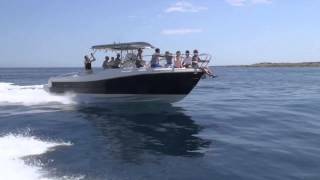 This luxurious rib is an exceptional boat, its layout is extremely well adapted to the needs of the families or to the groups. Its qualities of navigation are perfect even in very rough sea. Equipments: – the very large hard top offers great shade + additional sun awning over the stern can be installed in 2 minutes – VHF– GPS – WC – removable Table –CD + Ipod conection Bluethooh To make the day unforgettable, We guarantees : a fast boarding, directly at the boat (the route/itinerary to access to the boat will be sent by text or email), the rental contract will be on board, balance and deposit for fuel can be made by cash or credit card. We will check with you and with the captain the program you would like to do. . We can book a table at a restaurant if you need (the lunch for the captain is at our charge). With their moderate winds, their crystal waters, their beautiful beaches and coves considered the jewels of the Mediterranean, sailing in Ibiza and Formentera) is a unique and unforgettable experience. Trust in our crews, they will make you discover exceptional sites if you do not know them yet.